The late John Gaines was a master of many phases of the Thoroughbred industry: breeding, racing, and selling. Part of his marketing genius in the 1980s was to invest in older mares that had produced several stakes performers and breed them to one of the many stallions he had at his Gainesway Farm, so when the foals hit the yearling sales the catalog page was chock full of black type in the first dam. In the 1980s it was a lot easier to sell “paper” yearlings. Conformation was not nearly as paramount as it is now and there were a lot fewer tools—such as heart scans, scopes, etc.—other than a good eye to judge an individual. Based on the way the industry has changed over the last few years, those days are long gone. The Great Recession was a great shakeout of the market for many marginal players in the game (“dumb money,” as some call it), leaving a sharper, savvier buyer scouring over bloodstock that has had the smaller foal crops of the last several years separating most of the chaff from the wheat. The broodmares that buyers are looking for at this year’s breeding stock sales still need some pedigree and still need conformation and race record, but what they really need is youth. This isn’t just for mares selling during the glitz of the Fasig-Tipton Kentucky November sale, or Keeneland’s ongoing November sale such as our cover ladies; Aurelia and Eli. “Youth rules in this market. You have to pay for that,” said Central Kentucky horseman Tom Evans of Trackside Farm after stretching to $270,000 for a 4-year-old Speights­town filly in foal to Lea. California horseman Tom Bachman came away from the Keeneland sale with a pair of younger mares, a 7-year-old Malibu Moon mare in foal to Nyquist he plucked out of Book 2 and a stakes-winning Rockport Harbor mare in foal to Frosted he purchased in Book 3 for $230,000. Several studies have revealed the birth order of foals does have something to do with percentage of stakes winners. 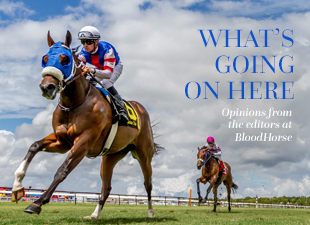 One of the latest studies was in BloodHorse MarketWatch in the issue of Sept. 22. It wasn’t just for mares, but for stallions’ foal crops as well. Sure, there are plenty of examples of older mares throwing top-level horses, but those are becoming the exception. Brogden pointed out Voodoo Lily, a grade 3 winner in 1990, was a star producer long after her Magical Illusion, a foal she had at 13, was a grade 1 stakes-placed. And Magical Illusion by the way is the second dam of Triple Crown winner Justify. Voodoo Lily had a stakes horse when she was 19 and another at 22. “It’s about the uterus for me. If the mare has a healthy uterine environment, she can be a super mare,” Brogden said. However, the market continues to hone in on the young mares, which allows for certain opportunities. It doesn’t pay to follow the herd. We’ve seen it before, and we’ll see it again. Keep shopping.